RFID: Radio Frequency Identification Denoting technologies that use radio waves to identify people and objects carrying encoded chips. These can include credit card information, passport identification or other forms of ID as well as access cards etc. With all the concerns about identity theft today and with the transition to credit and debit cards with embedded RFID chips, now was the time to step up and convert your old leather wallet for a newer RFID blocking one - Anti-theft RFID Blocking Armor! When you're shopping at holidays, RFID wallet protection secures your credit card and other RFID-chipped cards. Why do I choose Kupton? 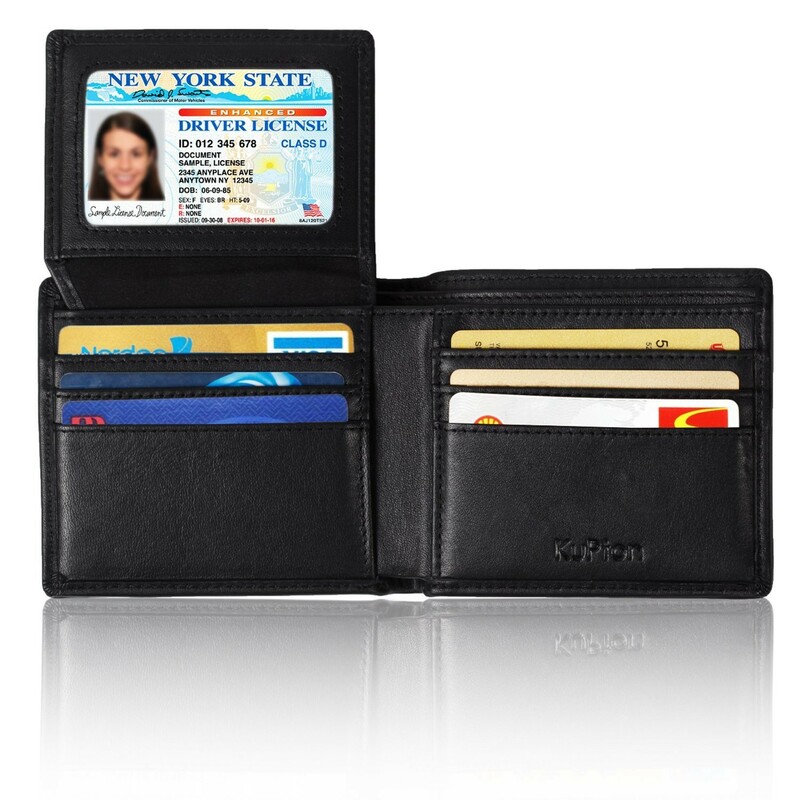 Luxurious feel, soft touch, smooth leather throughout and a good amount of pockets and slots for all your cards, cash and miscellaneous things people keep in their wallets. Choose Kupton secure wallets that block RFID, the latest built in RFID blocking protection will stop thieves from scanning and obtaining your credit card or other RFID coded information carried in your wallets. You now not only own a high-end men Napa leather wallet, but also a high-tech armor, a wallet that will block any attempt by unauthorized scanning devices to steal your credit card details. Featured by its slim and compact design, our RFID blocking wallet will fit both in front and back pockets of your jeans. 1 X Kupton Anti-theft RFID Blocking Armor comes with gift quality black packaging box, our fan-favorite 18-month warranty and friendly customer service.